When I loaded Draegnstoen up on Amazon it asked me if it was part of a series. I thought…uh, in the strictest sense of the word, I would have to say no. A few days ago I uploaded Draegnstoen to Barnes and Noble and it asked the same question. This time, after deciding what my next project was going to be, I gave *yes* as the answer. The next question was then: “What is the name of the series?” What? I had not even considered that question. However, after some pondering, I came up with *People of the Wall. * See below for the reasons. I think it fits rather well. 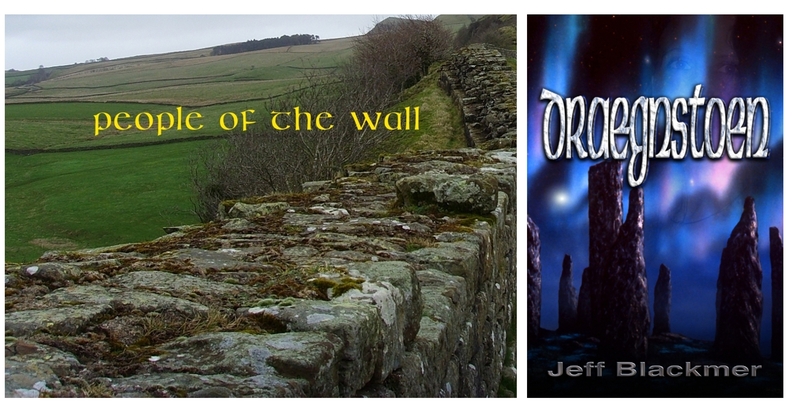 Draegnstoen, first book in the series, deals the builders of Hadrian’s Wall (the Romans), the conflicts it causes and the people who live in its shadow. Highland King, second book in the series, is about the divided kingdom of the Picts. A wall divides an area in two and Antonine’s wall, the northernmost Roman fortification, is symbolic of that division. Loss of Innocence, third and last book in the series, considers the radical changes that came about in Pictish society as a result of embracing Christianity and accepting the Law of Innocents. This story is symbolized by a ruined church wall from the medieval church at Iona, where the Law of Innocents was ratified. Jeff, what about having more to link the covers? Sticking to the same typeface and colour for the title, for instance. I think most series do this branding so fans will spot the other books. Good thought. I think you’re right. I’m liking that idea and I’ll play with it a bit more. Thanks for stopping by! Wow, that’s great! Congratulations Jeff. Hey Susy, thanks for visiting and all the great encouragement. It is much appreciated!